Let’s face it, regular toothbrushes simply cannot do the best job of cleaning your teeth by themselves. On average, only 43% of plaque is removed by brushing. There are parts of your mouth – like the gap between your teeth – that a toothbrush cannot even reach. While brushing twice a day is a must, if you want to remove the stubborn plaque out, you’re going to need some extra help. This is where an interdental brush comes in. These are toothbrushes with circular heads. They are inserted between your teeth for cleaning the areas your regular toothbrush can’t. Interdental Brushes – An Alternative to Flossing? Interdental brushes and floss, both, clean the interdental gaps between teeth. While they perform the same task, their applications differ a little. Floss is the perfect tool for cleaning the narrow interdental spaces, however, some teeth have wider gaps making them harder to clean. Moreover, those who have fixed braces or suffer from joint problems, causing limited mobility, are unable to use a floss. In these cases, an interdental brush can be effectively used for cleaning the interdental spaces as well as around braces and orthodontic wires. Since floss and interdental brushes have their own uses, they should both be a part of your dental care kit – floss for cleaning the entire tooth’s side and interdental brushes for wide gaps. How is an Interdental Brush Used? You can choose to use an interdental brush before or after brushing as per your preference. Pick the right size of interdental brush as per the gap between your teeth. If your teeth have wide gaps, then you will need a brush with longer bristles for effective cleaning. You may need to use different sized brushes for different teeth as well. 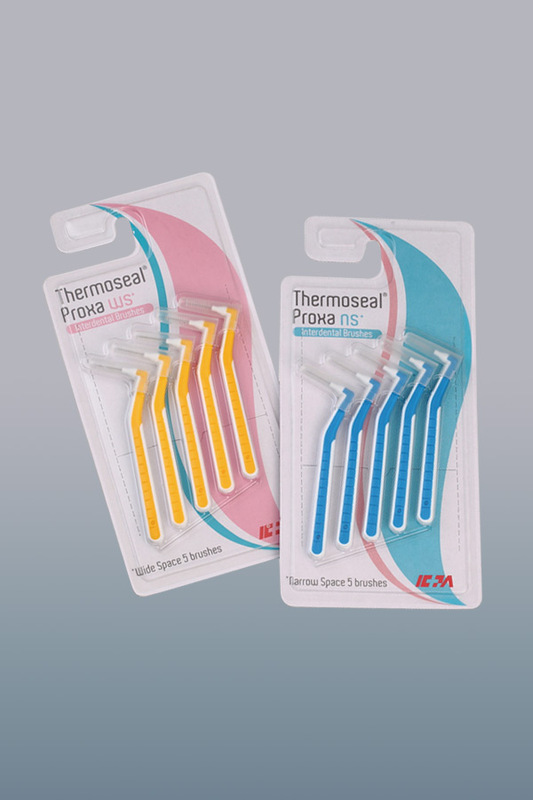 Feel free to check out our Thermoseal Proxa Interdental Brushes, which are available in two sizes, narrow and wide. Start with your front teeth as they are easier to reach. Once the front teeth are cleaned, move to the rear teeth. Ensure that no tooth is missed. Gently insert the brush between your teeth. Make sure you don’t force it in as this may injure your gums. Once inserted, move the interdental brush back and forth along its entire length a few times. Don’t panic if you find small amount of blood while rinsing, as this is normal. However, if the bleeding continues after a week, consult your dentist. Once you finish cleaning your teeth, rinse your interdental brush. These brushes should be replaced once the bristles are worn out or if the wire is bent. Dental plaque is detrimental to your oral health and should be removed regularly. You can do so without facing hassles with an interdental toothbrush. Get yours now! A Comparison of the Efficacy and Ease of Use of Dental Floss and Interproximal Brushes in a Randomised Split Mouth Trial Incorporating an Assessment of Subgingival Plaque. Noorlin I, Watts TL. Oral Health Prev Dent 2007; 5: 13-18.